Cheap and close. Those are the two criteria you use when you’re looking to buy land and you make only $7,000 a year. At least those were the two Nolan Ryan used back in the 1960s when he began buying ranchland in Gonzales County, Texas. Although the future Hall of Famer was already on his way to what would become the longest and one of the most storied legacies in Major League Baseball history, he was still in the early stages of his career, that iffy time when the future all-time strikeout king was trying to break into the Mets’ starting rotation. Back then, living in an apartment, he struggled to make ends meet (a far cry from the estimated $11,111 that Forbes calculates Roger Clemens will take home each time he throws a pitch for the Yankees in 2007). Yet all the while, Ryan knew what he wanted, both on the field and off. He had grown up in Alvin, a small Texas town on the rich coastal prairie just a few miles inland from the Gulf of Mexico. Although the teeming metropolis of Houston was less than an hour’s drive up the road, where Ryan called home was all country: acres of rice fields, stands of native hardwoods, and more cattle than people. Many of his parents’ friends were farmers, but Ryan had set his sights on something much different: becoming a cattleman. And a large part of that decision was the summers he spent on an uncle’s dairy farm. Nolan discusses the importance of land to raising his family HERE. “I would go in the summertime and be with him for a couple of weeks at a time on his dairy, and then as I got older, maybe go over there and help him with milking and stuff,” he says. Ryan briefly pauses, and a smile creeps across his face. “After being in a dairy and working a dairy, I knew I didn’t want to be in the dairy business, but I think that is where my love of the land and love of cattle started,” he sheepishly confesses. The quip is typical. In conversation, Ryan easily alternates between completely focused and totally laid back. With three ranches, two baseball franchises, and a wealth of other interests, he has learned to make the most of his time. He’s spent a good bit of his morning seated at the head of a long dining room table, taking phone calls, answering mail, and meticulously penning his autograph on different items. Yet on several occasions, when interrupted for different setups during the morning’s photo shoot, he quickly springs into action, changing shirts or donning a cowboy hat and hustling out the front door of the spacious ranch-style home that serves as ranch headquarters. Ten or fifteen minutes later, he strides back in, takes a seat, gets miked up, and picks up in midsentence right where he left off. WATCH as Nolan discusses why he became a cattle rancher. Forget about the induction ceremony at Cooperstown or which of his seven no-hitters stands out most. If you want to see the man get nostalgic, ask him what price he paid for good grazing land decades ago. “Well, when we started over in Gonzales County, we started at $200 an acre land, and that was smaller tracts. You probably could have bought larger tracts in those days in the late ’60s for $150 an acre,” he says. The going rate today? Depending on location, size, mineral rights, and access, somewhere in the range of $2,500 to $3,000 in the upland country. For the best land, down low along the county’s creeks and rivers, “the sky’s the limit,” he says. According to Ryan, a variety of factors have been pushing prices in his market higher, including Texas’ large urban population, the enormous amount of expendable income, and pressures from higher-priced states. “I think also that in California and in Florida that development is taking so much property and a lot of that was ag property and those folks are wanting to put their money doing a 1031 and putting their money back in real estate. And they still see Texas as a reasonable market. 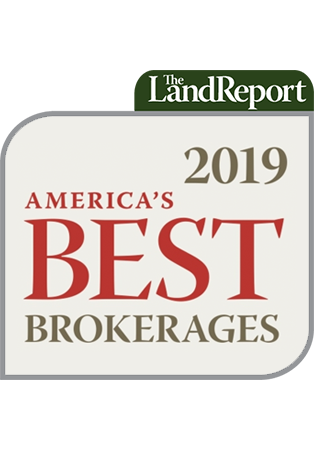 They don’t think it’s overpriced as we in Texas, who have gone through the 30-year period that we’re in and seen land prices escalate to the level they are—we view it differently. But people in other states that are accustomed to these kind of prices don’t see that, and they’re coming in and buying up some large ranches for substantially more than they were bringing as short as 18 months, two years ago,” he says. Ryan is all smiles thanks to some record rains on his ranch this year. Needless to say, the bottom land in Gonzales County that he and his wife, Ruth, began buying up decades ago has become quite popular in recent years. “It’s unique because the San Marcos and Guadalupe River come together in Gonzales County, so there was an awful lot of river-bottom country,” he says. The Ryans have acquired an ample share. The long and winding dirt road that leads to the ranch headquarters is submerged beneath swollen creeks in several places. In every direction, a lush carpet of tall grass fans out. Only a few feet off the side of the road, huge bulls lounge contentedly. Despite their enormous size, they seem extremely docile, relaxed even. These are not the testy sort of wild-eyed bad boys more inclined to run a man off than stand in place and chew grass. Ryan confirms this. “We will not have anything with a disposition problem,” he says. Like cattlemen everywhere, Ryan culls his herds based on several factors; ornery cattle are among the first to go. They tear stuff up, he says, and they are far more likely to injure those working with them. There’s even a financial incentive. “They have a deal that they’ve proven that cattle with disposition problems, you put them into any kind of stress situation, it affects the meat and it becomes what they call dark cutter,” he says, referring to a cheaper cut. Learn what Nolan’s toughest challenge as a landowner has been HERE. Ryan is no Coca-Cola cowboy. He regularly attends cattle industry seminars, and during the course of the morning’s conversations he mentions ideas and insights he has gleaned from a diverse group of experts, ranging from climatologists to livestock-facility designers. Just days ago he returned from a whirlwind trip to Japan, not as a tourist or a fastballer but as a spokesman for the U.S. Meat Export Federation. His stature as a beef producer is such that midway through his Japanese tour, he called in to discuss his trip with cattlemen attending the Cattle Industry Summer Conference in Denver. “It has given me a different perspective on Japan and on our industry over here, and I can honestly say from a producer’s standpoint I feel very, very good about it and very good about our product. I know that on the world market our product stands with anybody, and it truly is the best product in the world,” he told his fellow cattlemen. It goes without saying that he has some well-defined ideas about what to run on his ranches too. “Our basic cow herd is Beefmaster cattle, which is an American breed which started in Texas about 50 years ago. What it is, is a three-way cross between the Brahman, the Hereford, and Shorthorn. And then we will cross them with either Red or Black Angus bulls, and we also have a pure-bred Beefmaster herd. So it gives us an opportunity to develop our own replacement females, and we also have developed a replacement female business where we sell a lot of Beefmaster females commercially,” he says. 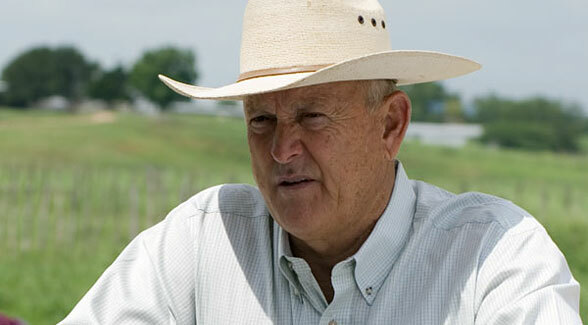 WATCH as Nolan Ryan discusses the cattle he runs on his ranches. In general, he is bullish on investing in land. “I’ve always felt like that in our country, land is a very good investment, and I think that if you put some thought and a little research in it, you can find a piece of property,” he says. Nationally, he sees several constituencies driving markets. “You have a group of land buyers that are moving out, wanting to live in a rural situation, and raise their families in that situation, and also put their children maybe into smaller school districts where they can be more involved and get them out of the metropolitan areas. I think that’s one group of buyers. And then I think there’s another group of buyers who have the income that they feel like they’re watching land prices go up, and they feel like if they continue, that’s going to eliminate them from ever owning something. And so I think a lot of those people are stepping out and buying property and just using it for a weekend place. … So I think we have different buyers driven by different reasons,” he says. With all these factors pushing rural land prices higher and higher, the longtime landowner senses a fundamental shift in the basic pricing structure of rural lands. “I don’t think that the economic value of lands is tied to the price anymore. I think the last place that was true was through the Midwest on farmland. Now that isn’t the case anymore. I think that there’s so many wealthy people, and they understand that there is just a limited number of those places that are so unique and so beautiful that people, if they have the opportunity to buy those places, there’s people that do, and because of that it has driven the price of those properties up to the point that they’re so few and far between that come on the market that, you know, who knows what the asking price is going to be. It’s going to be astronomical.” Although he shies away from predicting price appreciation of any sort, he regards the downside of investing in land much differently. “I don’t think you have near the exposure [of other investments],” he says. ONLINE EXTRA: Nolan Ryan Talks About Investing in Land HERE. SF — a town which still fawns over Bonds — win all the marbles. So let’s all climb on the “Ryan Express” and root for the Republic — it’s been a long 45 years! Thank you for such an edifying read. Best, Patrick. 2 Pings/Trackbacks for "Nolan Ryan Pitches the Perfect Investing Game"